Professor, thought leader, & researcher at the intersection of media literacy, education, communication and technology. This past week I had the privilege of conducted a brief 45-minute professional development session at a high-performing K-6 elementary school in northern New Jersey. In my initial consultation with the principal, we identified several areas of need. Yet, the one area that troubled him the most was the lack of authentic inclusion in classrooms with students with IEPs. This is a major challenge of ALL schools, as those that self-identify as inclusive education frequently do not engage teachers in co-teaching among the general, ESL, and/or special educator. Oftentimes the default is for the resource teacher to work in the back of the classroom with 1 or 2 students while the general educator instructs the rest of the class. This is not inclusive education. The Maryland Learning Network has a rich set of resources (and links) you can tap. 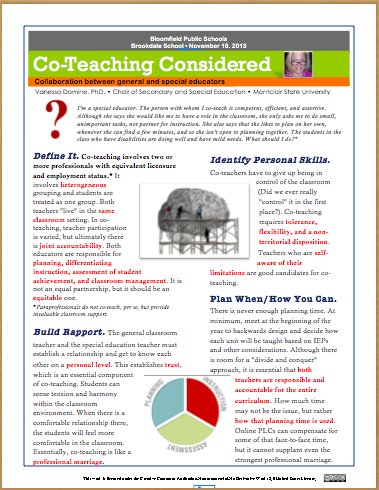 Teachers can also download the Maryland’s Co-Teaching Framework Tool while watching an archived webinar that overviews the framework. Another valuable resource is Marilyn Friend, Professor Emerita of Education in the Department of Specialized Education Services at The University of North Carolina at Greensboro, and Past President of the Council for Exceptional Children (CEC). Marilyn’s DVD “The Power of Two,” is a comprehensive resource for co-teaching. I especially appreciate the classroom examples of co-teaching in action. For “Co-Teaching Considered,” I asked the teachers to identify which co-teaching strategy or method was being employed in each classroom example. It generated interesting possibilities as well as problems that prevent co-teaching from happening. While lack of common planning time was one of the biggest preventers of co-teaching, I asserted that some of the collaborative work can happen online. It’s not how much time you spend in planning, it’s what you do with your planning time that makes all the difference. In the 2-page handout that I created as an anchor for our 45-minute discussion, you will find Marilyn’s definition of co-teaching alongside the various methods (Note that there is no one single best way to co-teach).I also include some areas that co-teachers should negotiate—such as personality styles, pedagogical strengths, grading, student discipline, and space issues, just to name a few. RSS feed Theme by Paperclip Themes.